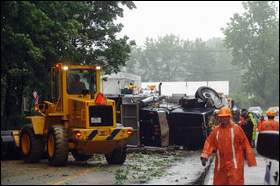 FISHKILL –A fallen tree sent a pickup truck airborne and led to a dump truck overturning, an accident that left two men injured and Route 9 closed for several hours Monday. About noon, a tree along Route 9 fell across the north and southbound lanes near the Dutchess Mall. Police believe the heavy rain caused the tree to fall. A northbound 12-wheel dump truck carrying a load of dirt tried to avoid the tree but ended up turning on its side and sliding into both lanes. The driver of the dump truck, Nestorio Gallegos, 39, of Elmsford, Westchester County, was working for Freddy’s Contracting in Peekskill. A pickup truck driven by George Monath, 55, of Carmel, was headed south on Route 9 when it drove over the tree, went airborne and crashed into the front of the dump truck. The pickup truck traveled another 100 feet before coming to a stop. Drivers hospitalized Both men were taken to Saint Francis Hospital in Poughkeepsie, where they were treated for undisclosed injuries, according to Fishkill town police Chief Don Williams. Williams said a preliminary investigation revealed Monath was driving without a driver’s license, an expired registration, switched license plates and no insurance. Officials from the Rombout and North Highlands fire departments, Mobile and Alamo ambulances and the state Department of Transportation assisted police at the scene. Northbound traffic on Route 9 was redirected at the Putnam County line while southbound traffic was re-directed at the Dutchess Mall. Tow trucks from Hyatt’s Garage in East Fishkill were called to the scene to help lift the truck upright. Route 9 was reopened about 2:30 p.m., according to Williams.